Kitchens of the Great Midwest’s Pat Prager lovingly crafts her Peanut Butter Bars to compete at her local fair. After some success, friends convince her to apply for a more elite competition. When she arrives, she is greeted by perhaps the most negative stereotype of the foodie snob and uber locavores. Her competition seems obsessed with the tiniest detail of where each ingredient comes from. The idea is so foreign to Pat that when she’s asked if her ingredients are “local”–she claims yes–she bought them at the grocery store a mile from her house. Her response is laughable to the foodies in attendance, but Pat is like a lot of people. Most of us have not ground our own flour, churned our own butter, or know the name of the cow (and it’s diet) that our milk came from (and on which day it was milked.) Should we care? Well. Surely there must be somewhere in between Pat and the food snobs. Locavores are people who pay attention to where their food comes from, and commit to eating local foods as much as possible. This benefits the local economy, but has greater effects also. 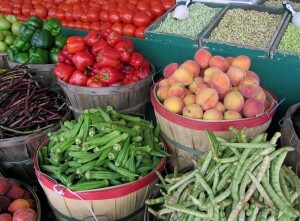 Consuming local food means less transportation, which supports green initiatives. The less processed your food, the better for your diet–and eating local also means eating seasonally, so you’re getting produce at it’s peak. Most would argue that the products also just plain taste better. That doesn’t mean you have to feel terrible about still shopping at the grocery store. Ten steps to becoming a locavore offers some steps that will help you become more mindful of where your food comes from. One suggestion is to choose just 5 foods that you can buy locally. I bet peaches would top all of our lists there. If Kitchens has you thinking about the topic a little more, might I suggest Barbara Kingsolver’s Animal, Vegetable, Miracle: A Year of Food Life. The novelist writes about her family’s year of experimenting with the locavore lifestyle, and it is both informative and entertaining. 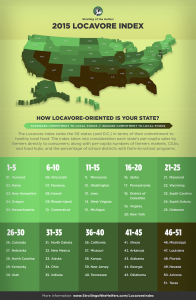 In general, how locavore is Colorado? Strolling of the Heifers, a Vermont-based organization, rates all the states on the Locavore index. Colorado is right in the middle–number 26. New England states top the list. J. Ryan is accurately portraying how important this is to folks in the midwest–Wisconsin, Minnesota and Michigan are all in the top 15. This Tuesday, we’re excited to host 5 local food experts who will discuss the importance of local eating and its benefits. Local Foods: From Farm to Plate will be at the Central Library on Tuesday, February 23rd at 6:00 pm. Also coming up this week, the film Secrets and Lies, showing at the Central Library on Sunday the 21st at 1:30, explores the theme of adoption. The Library will also host our two last book discussions this week. We’d love to have you join in the conversation! Thursday, February 25th at the Central Library at 6 pm. Saturday, February 27th at the Palisade Library at 10 am.